Indian head massage is based on the Ayurvedic system of healing which has been practiced in India for over a thousand years and is especially good for relieving stress, tension, fatigue, insomnia, headaches, migraine and sinusitis. Though Indian Head Massage was originally designed for use on the head only, today it has been westernised to include other parts of the body vulnerable to stress, such as the shoulders, upper arms and neck, as collectively they represent a de-stressing effect on the whole body. Head massage has therefore become a primary form of stress management treatment in the western world. The client sits in a chair for the treatment and the therapist uses a range of different movements including application of deep kneading and compression movements over the neck, shoulder and scalp areas. In addition, the therapist will also use their fingertips to treat pressure points on the face. Clients report that the experience is deeply relaxing and calming, leaving them feeling revitalised, energised and better able to concentrate. A combination of Deep Tissue and Indian Head Massage applied to the feet, upper back, neck, scalp (optional) and face. This is a great treatment to quickly alleviate tension that may have built up in zones of the body that are vulnerable to be triggered by stress as a result of emotional, psychological or physical factors. No oil is used on the scalp or face so after an hour you will leave feeling fresh, relaxed and energised. This treatment is also ideal for pregnant women. If deep pressure is not for you, why not try a less vigorous and more calming hour of treatment with a Patchouli, Lavender and Rosemary Essential Oil Blend. 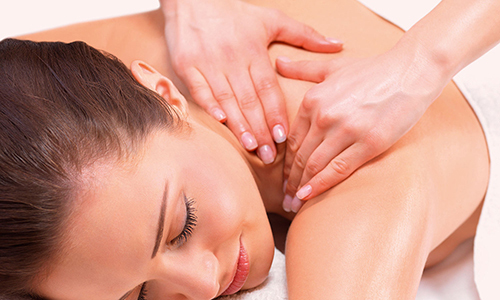 A light to medium depth massage, depending on your preference, will leave you feeling re-balanced and soothed.